The Stamp Man: New Alcohol Inks from Dreamweaver! 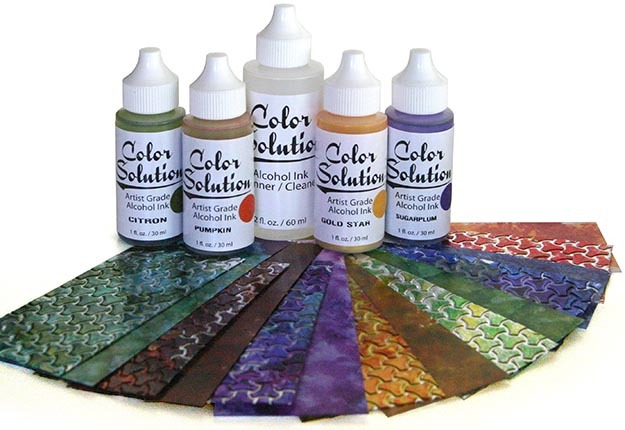 The new inks are called Color Solutions, I have resisted the huge temptation to correct the spelling! Like me, you've probably already got alcohol inks but despite that I shall be getting these as the colours are different and really work well together. I attended the Woodware Retailer Day last September and had a chance to play with these and I have to admit that at I initially wondered how alcohol inks and Dreamweaver stencils would go together but yes, of course, metal embossing with stencils and colouring the metal, but then our projects included using them over the glossy pastes. Think about it... Pure genius!!! You'd use them on glossy card so why not the glossy pastes. It was great playing with alcohol inks, pastes and stencils and I have been waiting for the products to arrive so I can have another play. It is all in stock now, just the hard decision on which colours to go for first!! The Color Solution alcohol inks are good quality and a great palette of colours that are different to the Ranger ones. They may look more expensive but they come in much larger bottles, so probably work out about the same. The Ranger inks are 15 ml and these are double the quantity in 30ml bottles. We used the inks over gloss white paste. So, the Dreamweaver section of our website is all up to date with the new stencils, inks and all the photos are there now too. I can tick that box for now and am getting on with adding other stuff. Thanks for sharing this. These inks look and sound a good idea. will have to try them sometime. Is your shop still open in Skipton? I havnt been over for a while now. Which days are you open? Hi Sharon, thanks for your comment. The shop isn't open any more, we still do online shopping and have a new website. We are also attending more shows. Just happened upon your blog and loooooove. So inspiring! I'm goign to showcase you on todays post, showcasing some great male crafters! following you as well.